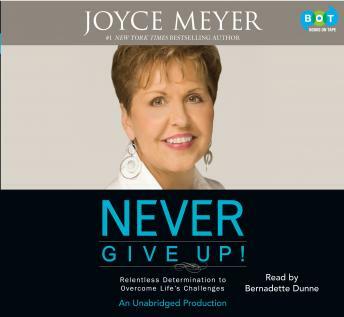 Joyce Meyer is an expert at perseverance and overcoming seemingly insurmountable obstacles. She survived an abusive childhood, a bad marriage, and extremely limited opportunities to become one of the most popular author/speakers in the world. Never Give Up! is packed with examples of people who pursued their goals relentlessly. Joyce profiles nearly fifty individuals who prevailed against all odds–from the builder of the Brooklyn Bridge to the chemists who invented Post-it notes. We meet people who have experienced terrible tragedy and prevailed, including Marian Hammaren, whose only child was killed in the Virginia Tech shootings, and Aron Ralston, who amputated his own hand to survive a hiking accident. We also meet Bessie Coleman, an African-American who had to go to flight school in Paris in order to learn how to fly, becoming the first woman in America to earn her pilot’s license in 1920. Never Give Up! provides solid, tried-and-true tools to meet life’s challenges and reminds us that with God, nothing is impossible.